Our most popular SUP tour location, the Kitty Hawk Stand Up Paddle Tour is excellent for first timers and young SUPers. The Kitty Hawk Stand Up Paddle Tour explores the calm bays and sheltered waters of Kitty Hawk, an ideal place to learn how to stand up paddleboard for the first time. This tour leaves standup paddleboarding from our shop in Kitty Hawk and explores the North Carolina Coastal Reserve, one of the few intact maritime forest environments on the Outer Banks. We will also paddle the salt marsh waterways between Martin’s Point and Southern Shores. The Kitty Hawk Stand Up Paddle Tour is just for you. This is THE BEST locale for beginners and to get on the water on windy days because of the shelter provided by Live Oaks and Loblolly Pine trees insuring smooth waters, even during the Outer Banks’ strong and freuent Nor’easters! 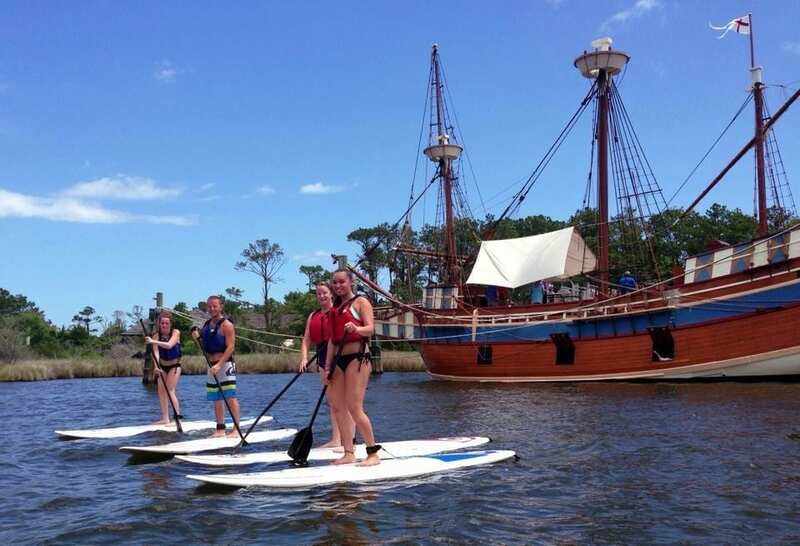 Learn about the rich history of Roanoke Island on our Roanoke Island Stand Up Paddle Tour while SUPing through its protected canals and waterways. Roanoke Island was witness to the first English settlement in the New World and happens to be a killer SUP spot as well! Downtown Manteo is a great standup paddleboarding environment located between the Outer Banks and the mainland and also provides an ideal activity to begin your exploration of the Outer Banks and Roanoke Island. This spot offers a great variety of options given most weather. Exploring the Roanoke Sound, salt marsh canals or the Manteo harbor are all options at our disposal. This is a killer place for beginner and experienced SUPers alike and leaves out of the Kitty Hawk Kites store in Downtown Manteo. 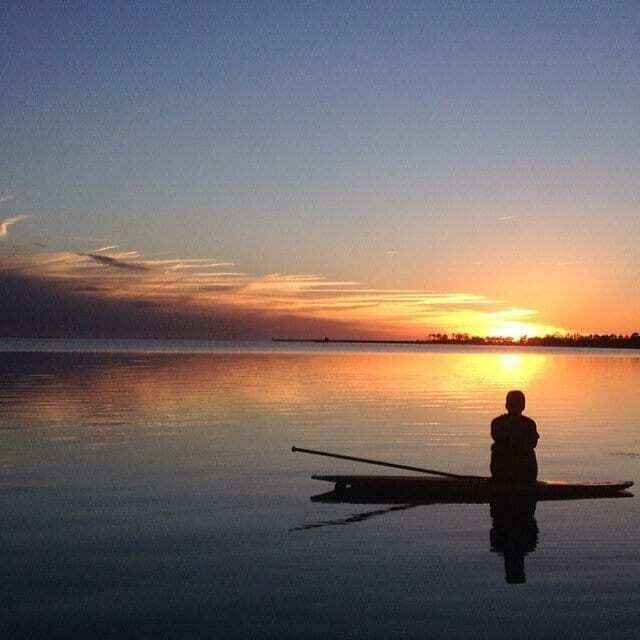 Our Duck Stand Up Paddle Tour offers spectacular Sunsets and flat-water paddling on the Currituck Sound of the northern Outer Banks. The Duck Stand Up Paddleboard Tour located on the boarder of Duck and Corolla on the Currituck Sound of the Northern Outer Banks. Our Duck Stand Up Paddle Tour launches at the newly renovated Sanderling Resort & Spa and paddle around the salt marsh islands and flat-water of the Currituck Sound. This is a killer place for beginner SUPers and also packs a punch with its gorgeous sunset SUP tours!!!!! This is a killer place for beginner and experienced SUPers alike. The Cape Hatteras National Seashore Stand Up Paddle Tour explores the salt marsh canals and open sound environments of the Pamlico Sound on Hatteras Island in the Salvo Day Use Area, just south of Salvo. The Cape Hatteras National Seashore Stand Up Paddle Tour is the perfect place for folks staying on Hatteras Island to learn how to stand up paddleboard in a true national treasure: the Cape Hatteras National Seashore. This location is just a short drive from Rodanthe, Waves, Salvo, Avon, Buxton, Frisco, or Hatteras Village. On this SUP tour, we frequently spot ospreys, pelicans, herons, egrets, ibis, terns, rails, skimmers, wrens, and warbles just to name a few. We will tour the salt marsh canals and flat-waters of the Pamlico Sound. This SUP tour location also packs a punch with its unreal sunsets!!!! This is a killer place for beginner and experienced SUPers alike. We are now offering Outer Banks SUP Yoga classes on Tuesday and Thursday mornings all summer long at 7:30am. This introduction to the possibilities of your yoga practice on a stand up paddleboard is a great way to explore the possibilities of yoga from an SUP. The New Radical Way to SUP the Outer Banks. 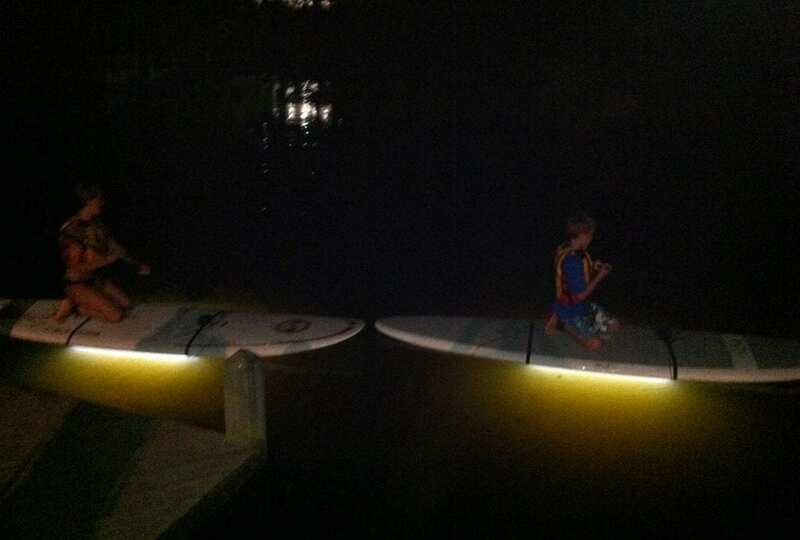 The only way to explain this Outer Banks Night SUP tour is to do it!!! The pictures don’t do it justice either. This is a killer place for beginner and experienced SUPers alike and leaves out of the Kitty Hawk Kayak & Surf School location in Kitty Hawk. We have been shred-ucating visitors and locals alike of the Outer Banks since 2004 so come on in and shred off in one of our Outer Banks Surf Lessons!! A typical Outer Banks Surf Lesson lasts 1.5 – 2 hours and begins with a safety talk and learning the anatomy of a surfboard. Next paddling techniques, balance and feet positioning are discussed. Participants then practice popping up onto the surfboard on the beach before getting wet. Our instructors are there to help you catch waves and answer any questions you might have about surfing, the ocean, waves, or surf culture. They shred before or after the lesson so you will spend more time catching waves instead of watching them shred. The OBX has some of the best surf conditions for beginner surf lessons on the East Coast so come on out and shred wih us!! Why Take A Surf Lesson with Us? We have been shred-ucating visitors and locals alike of the Outer Banks since 2004 so come on in and shred off in one of our Outer Banks Surf Lessons. The Kitty Hawk Kayak & Surf School was the first surf school on the Outer Banks to receive National Surf School and Instructor Certification for our business, and all instructors are CPR certified, follow the NSSIA guidlines for safe shreducation and have years of experience shredding locally and worldwide!!! We maintain a istructor to student ratio of 1 instructor to every 4 students to insure a safe, fun an educational experience. We also keep a close eye on the ocean with daily surf checks at dawn to make sure the condtitions are optimal for surf lessons. That means no shredding on red flag days or days with too much current, drift or big surf. At Kitty Hawk Kayak & Surf School, safety is our number 1 priority!! Our lead instructor Herman Hall has taught people how to surf on four continents and is the area’s first licensed surf instructor and surf coach through the National Surf School and Instructor Association (NSSIA). Put that with our experienced staff, perfect beginner surfboard, warm water and consistent waves, and you have the perfect recipe for shredding. Free wetsuit rental if the water is cold. Boards available for rent after the lesson.